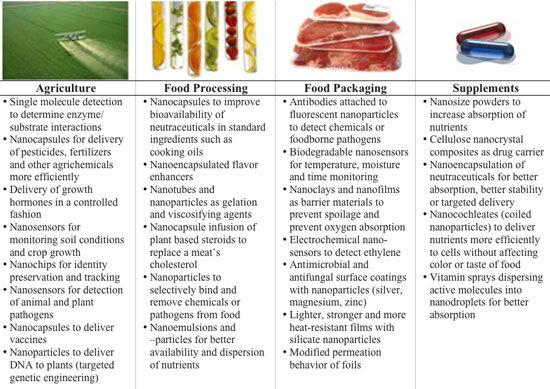 (Nanowerk Spotlight) Back in the early 2000's, food nanotechnology seemed to be a very hot topic and large industrial food companies were eager to explore new opportunities offered by nanotechnology applications. Then, as critical voices from NGOs (see for instance FoE's report: "Out of the laboratory and on to our plates: Nanotechnology in food and agriculture") and regulators (UK House of Lords report: "Nanotechnologies and Food") appeared, the food industry went into silent mode (see our Nanowerk Spotlight: "Food nanotechnology – how the industry is blowing it"). But that doesn't mean that food nanotechnologies aren't being researched and developed in labs around the world. It appears that we are still some way from seeing "Frankenfoods" in supermarket shelves – pizza that changes its taste depending on the temperature you bake it; or wine that you design by microwaving it. According to a recent commentary by Timothy Duncan from the U.S. Food and Drug Administration (FDA) in Nature Nanotechnology ("The communication challenges presented by nanofoods"), what's holding back the introduction of nanofoods is the hesitation of the food industry, fearing a public backlash along the lines of what happened wit genetically modified foods, and public fears in some countries about tampering with nature. "Mishandling of previous food technology debates has put nanofoods at a disadvantage by conditioning the public to distrust the food industry and the oversight system responsible for regulating it," writes Duncan. "On the other hand, the history of agricultural biotechnology has taught some lessons about the value of clear communication and respecting public opinion, which many organizations are heeding." He argues that, at the moment, it is an open question whether media coverage will provide a balanced portrayal of the potential benefits and risks posed by the incorporation of engineered nanomaterials into food and food-related products, or whether a gradual change to exaggerated headlines will lead to ripple effects that endanger not only the future of nanofoods. But apart from media, the food industry itself has a major role when it comes to interacting with the public about nanofoods – and so far it has remained relatively uninvolved. As the Centre for Business Relationships, Accountability, Sustainability and Society at Cardiff University points out ("CSR in the UK Nanotechnology Industry: Attitudes and Prospects"), "corporate social responsibility is currently interpreted by industry as 'doing no harm', and that industry formulates risk-management policy as a reaction to government regulations rather than from a need to anticipate potential future impacts of their products." Duncan recommends that the food industry needs to act in order to prevent the public's downstream concerns related to nanofoods from becoming a source of dread, distrust and ultimately rejection. "That said, it is important for all stakeholders to take a long-term view of their public outreach activities, and to not abandon trust-building or engagement efforts if they do not yield immediate public support for marketable nanotechnologies. Rather, public engagement should be treated as an investment in the future; building dividends takes time, patience and persistence."